Jim Palmer to the Orioles. A career that started with the St. Louis Browns. With the Club's move he became part of the Baltimore Orioles Organization. A few years ago he retired from the Orioles having been with them for Thirty Five years. Major League Baseball gave him the name 'Super Scout', as he worked to bring Baltimore "Classic Baseball", including the World Series Championship. With the completion of the 2003 season, the Baltimore Orioles are initiating the prestigious Jim Russo Scout Of The Year Award. During his first 30 years, Baltimore was the most successful Club in Major League Baseball. 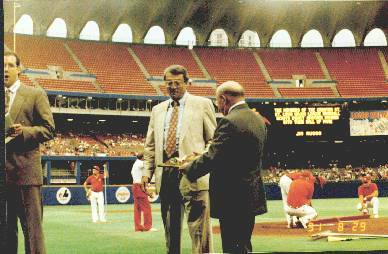 Here are Photos as he was inducted into The Scouts Hall of Fame, St. Louis 1991. 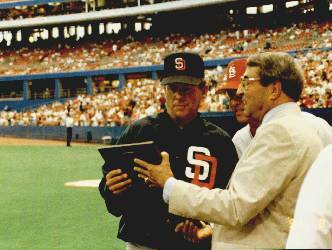 Two photos on the right......... Jim Russo giving commentary and "Play by play" as a radio Sports Director that knew his baseball. One of his greatest attributes, is the family value standard he lives and promotes. My Uncle, Jim Russo, was a wonderful man. He Passed Away February 8, 2004. A trivia note: Famous sportscaster Chris Schenkel and Jim Russo, graduated from the same High School; just two or three years apart.....Bippus High School / Huntington County, Huntington, Indiana.